I was sitting at lunch yesterday with Trophi Girl and my new sidekick Wally Banana. Trophi Girl’s Blackberry buzzed, she checked her email and stared laugh. “Edmonton Tourist you HAVE to do this and blog about it!! !” she exclaimed. Looks like fun doesn’t it? I checked out the website and looked at the rehearsal times. It really looks like a great time. I just don’t have the time to fit it into my schedule. I was thinking, that shouldn’t stop me from “Flashmobbing” when ever I feel like it! So I decided to incoororate it into my daily routine. At work this morning, I was in the photocopy room, a colleague walked by and was humming a tune. I joined in with lyrics. Shortly thereafter, we were Flashmobbing! One more person joined in and it was a full on party! Then as quickly as it started, it ended. We left to go complete some work that required our attention, but we had smiles on our faces. Fast-forward to lunch. I have a million and one songs ready for any occasion. I was inspired to sing “I like banana’s because they have no bones” because of my yogurt. Suddenly my knees and toes starting joining in. My sidekick Wally Banana’s shoulders started Flashmobbing too! I have Flashmobbed with my offspring at grocery stores and parking lots. It is fun to do. I do get odd looks from people, but I don’t care. It’s part of what causes me to smile. 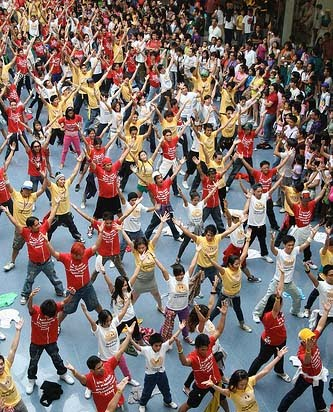 One day I really want to be a part of an organized Flashmob. It might be fun to do for a year end wind up at work. One day I will do it. Hopefully soon, like next summer. Meanwhile, I will watch my favorite Flashmob scenes and practice. The Flashmob happened Downtown tonight for the Grey Cup opening ceremonies. Here is what it looked like from City Hall tonight. No I wasn’t there but it looked like FUN! The Next time I fly into to London I am TOTALLY expecting that kind of welcome!!! You cannot even know how happy this post makes me! Please look back on my post “Brr….its cold in here…..”…would this be considered Flashmobbing? Hope you have a fabulous day Ms. Travel Pants! I know a great lawyer if there is, I will come to your defense! Dance like you mean it CatMan! ragrobyn, I almost couldn’t find your site because of the design change! I was trying to look for the “blog about the family with Muppets” but none of the pages I looked at reminded me of yours. Did you indeed change your theme? Glad I finally found it! Here I am! Here I am! I’m glad you were persistent 🙂 I did change my theme. I liked all the features on this one! Thanks for stopping by! That video made my morning!! I’m so glad! Then my work here is done!